In the wake of Donald Trump's ascendence to the US presidency and with pervasive monitoring of our every digital move, George Orwell's 1984 has once again been catapulted into the top-seller lists and media commentary. It seems Orwell's dystopic vision is as relevant as ever. This piece is a great starting point for a brief background on 1984 in this era of misinformation and fake news. "The dystopia described in George Orwell’s nearly 70-year-old novel '1984' suddenly feels all too familiar. A world in which Big Brother (or maybe the National Security Agency) is always listening in, and high-tech devices can eavesdrop in people’s homes." A historian from discusses the background behind Orwell’s esteemed work and the internet’s influence on ‘double think’ in the form of ‘alternative facts’ and 'fake news'. "Orwell could not have imagined the internet and its role in distributing alternative facts, nor that people would carry around Telescreens in their pockets in the form of smartphones. There is no Ministry of Truth distributing and policing information, and in a way everyone is Big Brother." In this piece, the author retracts his former belief that Orwell’s extrapolations of the future were lacking the imagination of rival dystopian literature. What changed his mind? Trump. "As Orwell’s book duly climbs high in the Amazon rankings: it was far better and smarter than good times past allowed us to think. What it took, of course, to change this view was the Presidency of Donald Trump." Three Orwell experts reveal their opinions on 1984’s relevance in the age of Donald Trump. "Then there is privacy – Orwell puts the diary and the private self at the heart of his writing. In 1984, keeping a diary is Winston’s first act of transgression." 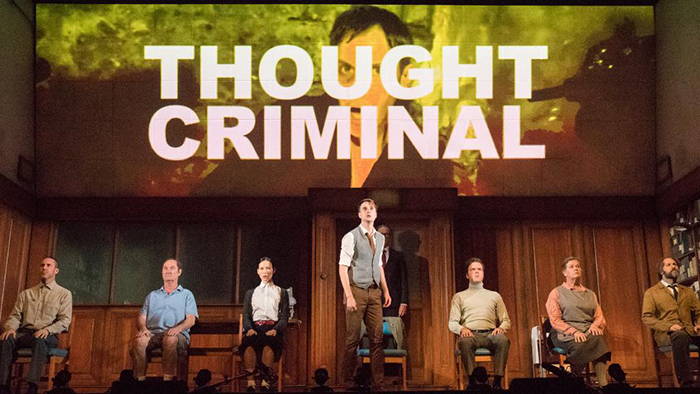 A lawyer and former hacker describes his personal connection with 1984, outlines the parallels between Donald Trump and Orwell’s ‘doublethink’, and makes a compelling argument as to why the text needs to be read – and reread – right now. "If the sales figures tell us anything, it's that we are right to want a fuller account of the comparisons between literature's most infamous cautionary dystopia and a new American presidential administration." Cyber espionage and privacy are under the spotlight in this article that reveals some of the ways governments already spy on our private lives. "When George Orwell envisioned the "telescreen" – the TV that keeps constant tabs on its viewers – in 1984, he predicted that governments would use technology to cross the threshold into our private lives." This article explores the shortcomings of Orwell’s dystopian predictions and examines his theories in a contemporary capitalist context – while speculating on his likely fascination at how big corporations monitor the public online for monetary gain. "The chilling fact is that anyone using the internet is being monitored endlessly by companies eager to sell them more goods. Just as Orwell’s Big Brother conducted personal observation of citizens, so do too these companies – and far more efficiently than did Orwell’s clumsy monster." From The Japan Times, this article explores the birth of ‘fake news’ and the real-life manifestations of Orwell’s Ministry of Truth. "'Post-truth', 'fake news', 'alternative facts' – Big Brother would feel right at home among us." A teacher's insights into how his students relate to 1984 differently in the age of Trump. "Right now, some of my students are afraid that their world may start to feel more like the one they’re reading about in the book and experiencing in my classroom." A look at the issue from inside the tech industry. "Microsoft’s CEO has warned the technology industry against creating a dystopian future, the likes of which have been predicted by authors including George Orwell and Aldous Huxley." Have you read a great article on how 2017 looks a lot like 1984? Share it with us on Facebook or Twitter and we'll pass it on.